Journalists and bloggers who have seen Windows 8 have almost universally loved it. Well, the Metro parts at least. It is clean, it jettisons a whole lot of Windows legacy junk and it just looks and feels so cool. But what happens when you put it into the hands of a regular user? 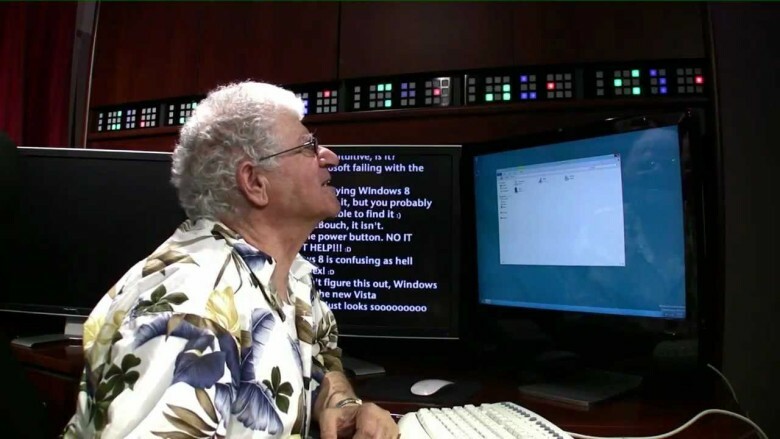 Above you see a the father of internet over-sharer Chris Pirillo trying out Windows 8 on the desktop. The result is so frustrating I suggest you skip the first three minutes entirely. We are by now very familiar with the YouTube phenomenon of previously computer-phobic people — old folks, people with autism — taking to the iPad without even trying. If this is Microsoft’s effort to compete with both the iPad and the Mac, it’s doing something wrong. Sure, hiding all menu bars and navigation elements makes for a clean screen, but so does switching that screen off. And to the average computer user, both of those actions results in the same thing: a useless computer. But the best part is the finale: “Now who’s put this out?” asks Chris’s dad. “Microsoft.” says Chris. “They trying to drive me to Mac?” says his dad.